Our Journey is as grand a soul as we have ever encountered. 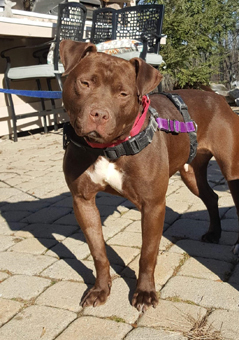 This stalwart, muscular beauty is a natural born cuddler who longs to become someone's Number One. She came to us recently from a Veterans' Foster Care program, where she received quite a bit of advanced obedience training. She was scheduled to join a disabled veteran in his home, as a service dog, but the gentleman dropped out of the program, and now Journey is high and dry. 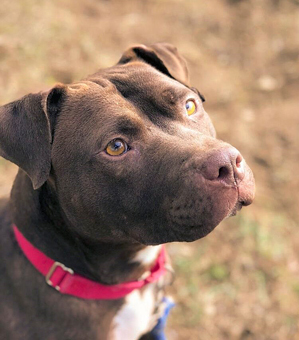 Initially, Journey was found as a city stray in Baltimore, and her behavior evaluations were so exceptional, that she immediately attracted the attention of a local Veterans program. 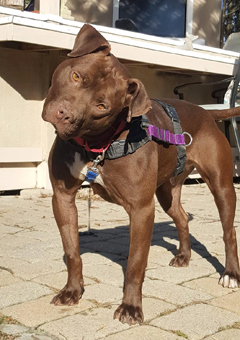 Despite frantic shelter life, Journey has made a remarkable impression on everyone she met. Shelter staff and volunteers agreed that Journey is spectacular. We were made aware of Journey's plight and were asked to step up for her. We are so glad we did. This dog is destined to be the light of someone's life. She is an older puppy, just two years old, who's training had been neglected in her former life. Journey's temperament is pure gold. She loves everyone, and is so full of joy, that she lights up a room when she enters. 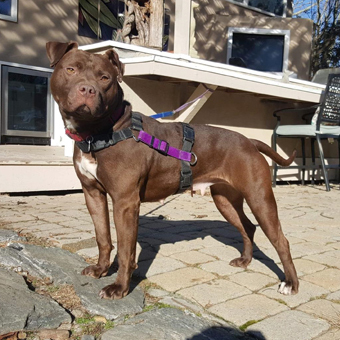 In a culture that vilifies the Bully Breeds, Journey stands out as an ideal dog for an active family with kids. She is a reddish-brown American Staffordshire Terrier, and is a high energy dog, muscular and strong at 50 pounds. While she loves to play with kids, and she would do best in an active home, in which she can play a prominant role, with folks who understand the ongoing importance of exercise and leadership. If Journey is neglected to the point of boredom and frustration, she will likely make mayhem. 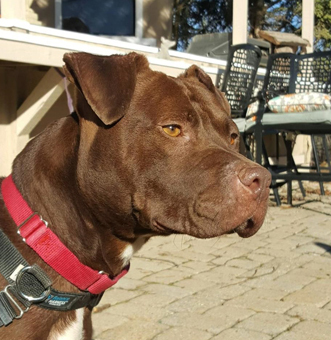 Journey enjoys the companionship of other dogs, but is prone to rough-house play. She can easily join a multi-dog home, but energy levels must be matched and some attempt must be made to maintain calm, because rough play can bubble over into canine disagreements. We have not had her around cats, but she would definitely chase them in play beyond their tolerance. Journey is responding beautifully to her leash training, and is fairly easy to handle. However, some physical strength is necessary to handle her on lead, and she requires a good amount of exercise to keep her calm and focused. Journey has good house manners and is house trained and crate trained. 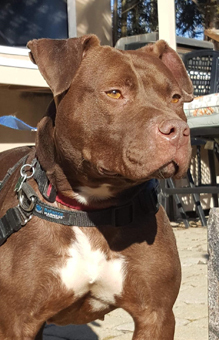 She will benefit from ongoing obedience work, but is full of potential for the right bully breed lover. 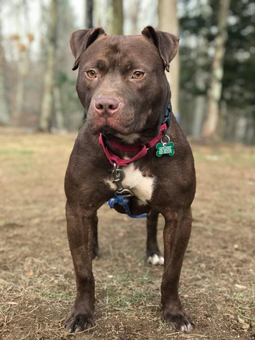 Journey has such a phenomenal temperament that she could easily coast all the way to Canine Good Citizenship Certification in the hands of motivated adopters. Journey is in excellent health, and is recently spayed. She is up to date on routine shots, and is dewormed and microchipped. Journey has tested negative for Heartworm, Lyme, Earlichia and Anaplasmosis. If you are interested in Journey, please email denise@eskiesonline.com or call/text Denise at 860-908-9738 for more info. About us: We are an active multi-breed dog rescue local to New England, situated in Canterbury, Connecticut. Our 21 year history is reflected in our website EskiesOnline.com, and on our Facebook page: Eskies Online.